I spend a lot of time working on my planners…keeping track of everything business and family related is somewhat of a challenge to say the least. With all kinds of different tasks floating around for both my business and home, sometimes I just feel like there is not enough time (or planners) to keep everything organized and efficient. PLUS what I need for each of them is different. Work is more about to-dos and getting things done and family is more about wrangling cats and making sure we are all moving in the right direction at the right time. I have had both combined and separate planners and learned a few things along the way! 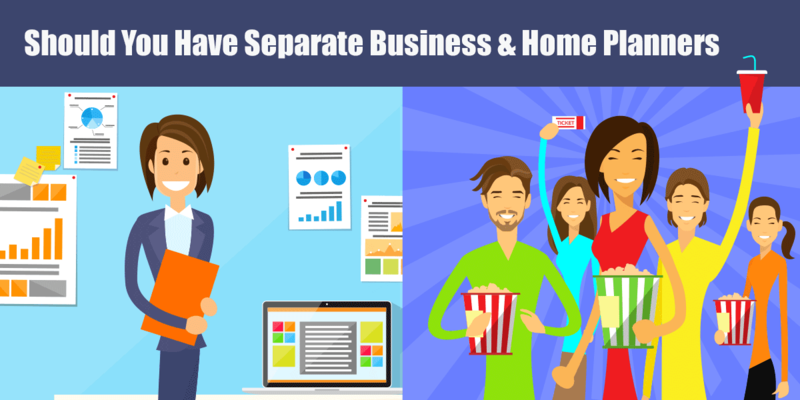 Here is my take on whether you should have separate business and home planners! Just few months ago I had a moment when I felt like everything was spiraling out of control! My three kids were running in all different directions, I had to co-ordinate rides and where everyone was going to be and I-JUST-HAD-ENOUGH! I pulled out a Happy Planner calendar that I had laying around and started filling it out. Yep, I took a couple of hours, got myself calmed down again and had what I thought was a great system. I would leave my “family calendar” on my desk and then have my work planner with always like I generally do. Well that fell apart fast. I was at meetings and trying to plan appointments when I kept saying I had to check and see if I would be available because my family planner was at home. I wound up right back in a mess of sticky notes and trying to remember to write things down. So for me, having the family CALENDAR in my planner is vital. I have to be able to plan my time all at once in one place! Because there is not that much overlap, I have the kids calendar in the back of my regular planner on a monthly calendar page. Yes, from time to time there is a day when I need more than one little square to record everything going on, but in general, there is plenty of room for everything and on those days I just have an extra sticky note. I have a Staples ARC system for my business planner, you could use that or 3 ring binder to start organizing your business. The nice thing for me about having a business planner separately is I can put it on my desk on Friday afternoon and leave it there until Monday morning. I admit, from time to time work does bleed into home time, but my goal is to keep them separate so having them separate just makes sense! That said, there are lots of family planner related things that I definitely do not want to lug around with me everywhere I go! Things like Christmas and birthday planning, recipes and meal planning and even my own artwork and creative bits. I am just getting a personal planner like this together so I am not going to talk about it much except to say that I really don’t think that these should be included in with a work planner for two reasons, first it would make it REALLY big and unwieldy and second, I like to focus on work when I am working but leave it behind when I am focused on family. If you are super organized and want to have everything all in on place, having a combined business and personal planner might be your best bet! It can be a beautiful thing, having everything you need all at once at your fingertips. Since the goal of any planner is to be as organized as possible, keeping everything in one place may be best for you and your family. Today’s crazy life is constantly changing. However you decide to organize your planner(s), just remember that you can always change it later if you need to. There is no “perfect planner” that will work all year long. Instead make sure you stay open to changing things around from time to time to make your planner work the best for you!